Read about choosing varieties and starting seedlings indoors in “Before the Thaw”. 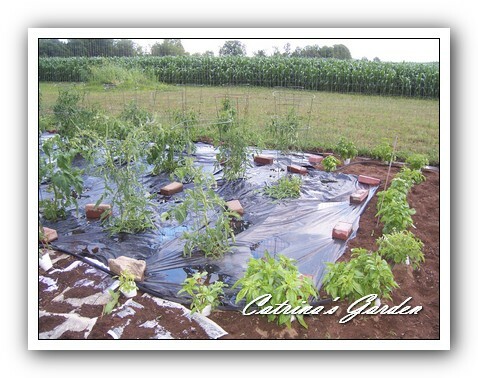 Then learn more about how to grow the other ingredients for your salsa in “Grow Your Own Fresh Ingredients”. Now you are ready. The fruits of your labor are hanging on the vine. Wouldn’t it be nice if all of the vegetables and herbs were ready at the same time? Unfortunately it doesn’t usually work that way. Some herbs are ready early and the peppers don’t usually show up in Wisconsin until quite late, while the tomatoes usually trickle in over a 2 month period. Tomatoes should be picked when they gain full or nearly full color and begin to soften. Pick them with the “cap” on (a small part of the vine), they keep longer that way. In hot weather fully ripe tomatoes don’t last long on the vine. They will ripen nicely on your kitchen counter. Don’t put tomatoes in the refrigerator. Peppers can be picked when they reach a nice size, but leave them on the vine longer so that they change to their fully ripe color to add extra color to your salsa. Peppers do not continue to ripen once you pick them. Be sure to thin your onions (you can eat the small green ones too) so that they have plenty of room to reach full size. Make sure to water them or they will never really fill out. Harvest your herbs when they are on the young side and preserve them by drying or freezing until it it’s time to make your salsa. Really, herbs can be snipped any time you need them, but ideally you would pick them in the morning after they were watered the night before. You can store your herbs for up to a week with the stems in cups of water on the counter or in the refrigerator. Don’t put basil in the refrigerator. It will turn brown. Tomatoes can be blended or chopped and frozen until you get enough to make a batch. Go ahead and add some of the herbs now, it’s easier than freezing them separately. Dice up some of the peppers too and freeze them if you get too many of them before it is time to make your salsa. Have fun watching your Salsa garden grow! In part one of Salsa Gardening – Before the thaw, we talked about getting your tomatoes and peppers planted. So what other plant “ingredients” can you add to your salsa garden? I should also mention that all of the “salsa plants” need sun so be sure to choose an open area. You can plant them kind of close but only if you intend to thin them to use for green onions. They need room once the bulb starts to swell. Onions are heavy feeders so add plenty of compost. Make sure the soil is loose. The bulbs can’t fill out in a heavy or compacted soil. Keep the area weeded. This is even more important than the rest of your garden. The onions won’t fill out with competition from weeds. Garlic – you may have to add this one next year because its best if planted in the fall. You can plant it in spring in areas with a longer growing season. Order some or get them from the garden center. Avoid grocery store garlic as it’s been treated so it won’t sprout. There are lots of varieties of heirloom garlic for you to try. Here are three of my favorites; Music, Shatili and Bogatyr. Try some white German porcelain (hard neck) varieties which store really well and some red Rocambole types which are great for roasting and are easy to peel. My favorite is Spanish Roja. 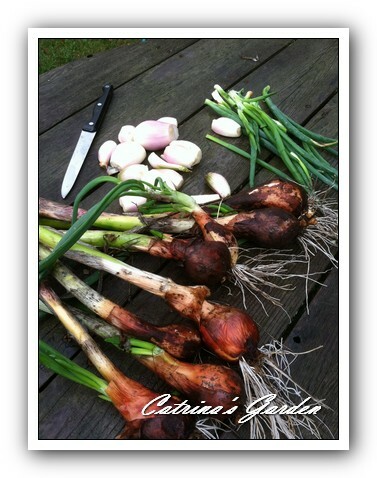 Garlic is in the allium family so all of the tips for onions apply for garlic too. Here are a few more growing tips. Separate the bulbs and plant the cloves individually. Keep the husks on. You will get the larger bulbs from the bigger cloves. I have seen different recommendations for how deep and how far apart. I like to do them about 4 inches apart and 6 inches deep. Some recommendations are as little as 2 inches deep. I think deeper is better in the north. Keep them watered during development but not overly wet. Let them dry out before harvest. Garlic scapes, flowers and bulbils are all edible (more on that later) but remove them so the energy goes into producing larger bulbs. Harvest when about half of the leaves have dried out. Hang your garlic and let it dry and cure in a warm area and then store it in a cool, dry place but not in a sealed container. Tomatillos – these are optional, for Salsa Verde. They are grown just like tomatoes except for a few major differences. You will need at least two plants. One plant will not pollinate itself and you will not get much fruit. The plants will get large and sprawl just like tomatoes, but I don’t usually prune them like tomatoes. Just cage them up. The fruits have a papery outer cover that will need to be removed before using. They are ready when they fill out the shell. Leave this on for storage. Herbs – Many people have a separate herb garden. You can still have that too, but put some herbs with your vegetables too. They attract pollinators and can help repel insect pests. They are also pretty and having them together makes harvest easier. Oregano – make sure you get the Greek oregano which has white flowers. It tastes much better than Oregano Vulgare which has pink flowers and can be invasive. Having your herbs near the peppers and tomatoes will help with pollination because they draw bees. Marjoram is similar to oregano but it is an annual. Pinch back often. You can read “Oregano can be confusing” for more on Oregano and Marjoram. Cilantro and Coriander are the leaves and the seeds of the same plant It will have to be planted more than once as it is a “quick plant”. I keep cilantro seeds in a waterproof container in the garden so I can replant whenever I harvest. Or, let the plant go to seed; it will self sow. The leaves can be used in fresh salsa, but they lose their flavor when used in salsa that is cooked down for a long time. For this type of salsa use ground coriander instead. Cumin – This herb is grown for the seed which is ground to make the spice. You can grow it if you like but if you do start seeds indoors along with the basil because it takes a very long season to mature. It is difficult in northern areas so it is okay to buy this one. It does make a great addition for the way it attracts beneficial insects, even if it never ripens. Basil is not usually used in salsa, but you can make some Bruschetta, too! Basil is an excellent companion plant for tomatoes. I think it actually helps them taste better…and it repels bad bugs like white flies and aphids. Plus, it draws bees to help with pollination. Borage; although I have not used it in my salsa, it will help repel the tomato horn worm. Thyme, Parsley, Dill, Garlic Chives and Chives could also be added to your salsa garden. Some other fruits and vegetables that will add a delicious twist to your fresh salsas include: watermelon, pineapple, strawberries, blueberries, cherries, pomegranate, mango, peach, apples, cranberries, black beans, corn, jicama, cucumber, pumpkin and avocado. There are also some common salsa ingredients that will probably not be grown in your garden. Of course no two salsas are alike so these are just suggested additives…You don’t have to use them all. Chili Powder – You could make your own if you want. There are many types to experiment with including cayenne, chipotle and paprika. Hot Sauce – Here’s another project you could try. Sugar – just a little; or consider trying a “better” sweetener like honey, maple syrup, agave or stevia. 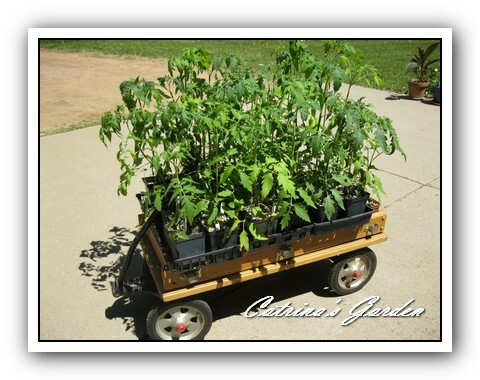 The miracle of planting a seed and watching it sprout is sure to give a kid “ownership” of his or her Salsa garden. “Getting it in the Garden” will be featured in next blog. Happy growing! They don’t come any cuter than Standard Dwarf Bearded (SDB) Iris “Boo”. She doesn’t get any taller than 12 inches. An amoena, which means that the standards are white and the falls are colored. In this case there is a crescent shaped purple spot on the falls with detailed veining and penciling near the beards, which are yellow. This cutie won the award of merit in 1976. They are early bloomers and you may want to get down close to smell the sweet fragrance. I just love the color of this historic Standard Dwarf Bearded (SDB) Iris. It’s a true sky blue, the ruffled falls and standards are the same color but there is noticeable darker blue veining throughout and a yellow beard for accent. This Iris pumila is about 12 inches tall and is great for the rock garden or front of the border. At three feet, this tall bearded iris is a Dominion seedling. It has perfect form and velvety texture. Lavender standards and rose purple falls accented with yellow beards and white penciling, make this old but really good iris one to have in your garden. It is well branched and so it blooms for a long period. Zone 3. When the rest of the garden is winding down, Autumn Joy is just getting started in fall with bright coral/pink flowers that later turn a beautiful rust color for winter interest. This hardy perennial is drought tolerant and not fussy about soil conditions as long as it is not too wet. The plants are just short of 2 feet tall and will form 2 foot wide clumps. The little mounds of foliage are also interesting in spring. All the care that is needed is to remove the old stalks near the ground in early spring before new growth starts. Bees also love this plant and it provides food for them when there isn’t much else. Sedum needs full sun. About 2 feet tall and hardy to zone 3 this native plant is easy, does not require watering and attractive to butterflies and pollinators. Its violet flowering stalks are attractive in the summer garden featuring rounded fluffy blooms topping clumps of grassy foliage.